The latest book by cyber-friend, medical colleague, and fellow author of medical suspense Michael Palmer will be released in about two weeks. The Last Surgeon opens with a scene that introduces us to a thoroughly unlikable villain. There's no doubt in this story who the bad guy is. The major question is who is behind the killings he carries out and why. Members of Brandilyn Collins' "big honkin' chickens club" may want to sleep with the light on after reading it. I was thinking about this today as I began writing the last third of my latest novel. Unlike a magician, who never reveals his secrets, I'm about to let you in on one of mine. When I begin a book, I know how it's going to start, the arc of the story, and how it will end. What I don't know is who the villain is going to be. Sound crazy? But it works. Throughout the book, I choose characters who may end up being the bad guy/gal, but often I'm at the end before I make that final decision. I plant appropriate clues along the way, some of them meaningful, others a "red herring." And if I don't know the identity of the villain or the exact reason for his/her actions, the reader is unlikely to understand until I do. What brought this to mind? I had to make a decision about the motivation of a certain character. And I actually found myself thinking, "But if that were true, it might ruin his life." The characters had become so real to me--as they do to many authors--that I was trying to protect this one's reputation. How's that for realism in writing? Anyway, I need to get back to bringing this novel to a close. Hmmmm. Who could have done that? And why? Guess you'll have to wait until September of 2011 to find out. But don't worry, there are two other books coming first, and I guarantee you won't know who the bad guy/gal is in them, either. After all, I didn't...until the end. What's Your "Sell By Date?" I was shopping last week when I noticed that some of the milk in the dairy case was nearing its "sell by" date. Naturally, I passed it by in favor of milk I could expect to be good for a longer time. I've recently noted the same phenomenon in the pharmacy, with some over-the-counter remedies there so near their expiration date that it made no sense to buy them. All this started me thinking about these dates. Should they be limited to foods and medications? Do humans carry a similar date? I guess, if you consider the Biblical three-score and ten predicted age, some of us are already past our "sell by" date. How about the things we do?Do our activities and projects carry an expected shelf life? Most likely they already do, and we just don't pay attention to it. During my thirty-five plus years practicing medicine, both as a private practitioner and a medical school professor, I wrote or edited eight textbooks. In medicine, knowledge changes fast. I noticed, the last time I checked online sources, that most of these books are still in print, and apparently some people are still buying them. But my co-authors and I have already revised the most recent "classic" text we wrote, and it's scheduled to undergo another revision soon. Probably 80% of the material in that book is still accurate, but in medicine, 100% is the gold standard. When the new edition comes out, the old one may not have passed its "sell by" date, but it will be nearing the end of its shelf life. vailable on or before April 1. Novels are a great way to reach the reading public, but they too have an expiration date of sorts. Other than true classics, novels have a finite shelf life. Once sales dwindle, the books go out of print, and other than in second-hand bookstores and garage sales, they disappear. They do their work, serve their purpose, then they're gone. To a writer, that's sad. My non-fiction book, The Tender Scar: Life After The Death Of A Spouse, hasn't set any sales records since it was printed in 2006, but the demand for it continues at a steady pace. In the publishing trade, you'd call it an "evergreen." But when something better comes out to take its place, it will go out of print. It will have reached the end of its shelf life. All this has made me begin thinking about the things I do every day: the way I interact with people, the example I set for my children and grandchildren, the things I try to accomplish. What's the shelf life of the results of those actions? If it's long, it's worth the effort. If not, maybe I should pass on it in favor of something of greater value. Think about what you're doing today. What's it's shelf life? I hope it's a long one. Today it's my privilege to interview author CJ Darlington. CJ's debut novel, Thicker Than Blood, releases soon. She's had an interesting journey into publication, and I think you'll enjoy meeting this young lady. RM: CJ, tell us a little about yourself. CJ: I’ve always loved to write, and being homeschooled for all my schooling years nurtured that love. I began writing the story that would become my first novel Thicker than Blood when I was fifteen, and I didn’t look back. By day I’m a used book dealer, and it was great fun to be able to incorporate some of the interesting book collecting tidbits I’ve learned through the years into Thicker than Blood. RM: Even before publication, you were known for your website, TitleTrakk.com. For those who’ve never checked out that site, tell my readers a bit about it. CJ: TitleTrakk.com is a Christian entertainment website my sister Tracy and I started for anyone interested in learning more about all the amazing Christian books, music and movies out there. It’s our goal to shine the spotlight on the newest and brightest in the industry, and we’re excited at the opportunity to every week bring our readers new interviews, reviews, contests and more. It’s been amazing how the site has grown in the past few years. RM: Thicker Than Blood was developed over a decade of writing. At what point did it go from a teen’s dream to the effort of a serious writer? CJ: I remember distinctly the moment when I was eighteen and decided I wanted to get serious. I had been working on “my story” off and on for a couple years, but I wanted to complete it and hopefully get it published. I gave myself five years to do that. I thought that would be plenty of time! The story gelled in my early twenties. I completed Thicker than Blood when I was twenty-four. Of course, it ended up being revised greatly even after that, but that gives you an idea of the timeline. RM: Share with us the role of the Christian Writers Guild in your progress as a writer. CJ: If it weren’t for the Christian Writers Guild I wouldn’t be doing this interview with you right now. They are the reason I am published with Tyndale House. Every year they run a contest called Operation First Novel. Writers submit their completed novels, and the staff reads all the submissions and sends the top four manuscripts to the Tyndale House acquisitions team who picks the winner. Part of the prize is publication by Tyndale. I entered an early version of my novel Thicker than Blood in the 2004 Operation First Novel contest. It placed as a semi-finalist. Then I entered a much-revised version of the novel in their 2008 contest, and it won! RM: Would you introduce my readers to Thicker Than Blood? CJ: Thicker than Blood is the story of two estranged sister, May & Christy Williams. Both have chosen different paths for their lives. They meet again after fifteen years, one needing God’s love, the other God’s help. Here’s what the back cover says: Christy Williams never imagined that a stolen Hemingway's first edition would lead her back to the sister she left fifteen years ago. But when things begin to unravel, she finds herself on May’s doorstep, fearing for her life. After a bittersweet reunion, will the two discover some hurts can’t be healed, or is there a tie that’s thicker than blood? RM: What’s next for CJ Darlington? CJ: I have completed the sequel to Thicker than Blood and have begun a third book now. The working title for the sequel is Innocent Blood. Some of the minor characters from Thicker become minor characters in Innocent. But there are many new characters as well. Rare books also feature prominently, especially a first edition of F. Scott Fitzgerald’s The Great Gatsby. The story revolves around a teenage girl named Roxi who finds herself homeless and in serious trouble. 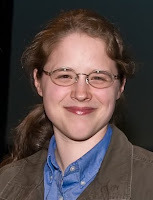 Another main character is bookstore manager Hunter Dawson’s older sister, Abby Dawson. RM: And (although it sounds like something the warden would say before the lights outside the prison dim), do you have any last words for us? CJ: Christian fiction has grown in quality and variety in the past ten years alone. If you tried it ten years ago and didn’t find something to your liking, could I encourage you to try again? There’s something for everyone to enjoy these days. Thanks so much for having me here, Richard! CJ, thanks for being here with us. Good luck with your writing. I have a strong feeling that we'll be hearing a lot more from you in the future. 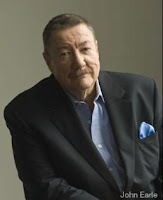 I was stunned today to learn of the death of author Robert B. Parker. I feel like I've lost a close friend, if not an actual family member. I've been a voracious reader since my youth, and learned to love the works of such writers as Agatha Christie, John D. MacDonald, Ross Thomas, Donald Westlake. I mourned the passing of each one, sad that there would be no more books from them. Now, Robert B. Parker has been added to that list. Today, Amazon posted an abbreviated biography, and I'd like to reproduce portions of it here. "Parker was named Grand Master of the 2002 Edgar Awards by the Mystery Writers of America, an honor shared with earlier masters such as Alfred Hitchcock and Ellery Queen. "Parker died on January 19, 2010, at the age of 77." During the darkest days of my life, the fourteen days when my wife, Cynthia, lay in the ICU of Zale University Hospital in a coma from which she would never recover, I passed the time by reading through all of Parker's novels. Each day, I managed to lose myself for a while in the adventures of his protagonists--Spenser, Jesse Stone, Sunny Randall--buoyed by the word pictures he painted and the stories he crafted. For this, I'll always be grateful. These are busy days. I've been talking with bookstores to arrange signings for April when my novel, Code Blue, debuts. Plans are almost complete for a launch party. But now some of my fellow authors have suggested that I need a press kit. I want to paraphrase the oft-misquoted line that originally came from Treasure Of The Sierra Madre: "We ain't got no badges. We don't need no badges! I don't have to show you any stinkin' badges!" Press kits. I don't need no stinkin' press kits. But, actually, I do. Surprisingly enough, I'm familiar with press kits from my years in medicine. During that time, I served as President or Vice-President of all the major societies in my specialty, as well as a long spell on the governing boards of these organizations. Along the way, I was associated with a number of activities and initiatives that would benefit from coverage by the media. Want to get press coverage? Make it easier for them to do their job. Put together a press kit with quotes, pictures (if applicable), and supporting material that can be plugged into a story. So, yes, if I want any publicity for Code Blue, I'm going to have to put together a press kit. But, since things have changed over the years and I'm trying to change with them, this one will be available online. In my press kit, I've included images of the book cover and the author, brief and longer bios and book descriptions, a link that allows for reading the first chapter, contact information, the book trailer, and links to my web site, my blog, and a couple of interviews I've done. I'm probably going to revise it several times, but for now, at least I've done this much. How about you? What would you add? I really didn't figure that putting together a press kit was part of the job description for "author," but I'm learning as I go along. I'm not sure what other unforeseen activities are going to be necessary as I travel this road, but as I encounter them, I'll share them with you, my readers. Thanks for coming along for the ride. Recently the dental hygienist was making conversation as she set out the instruments of torture she'd use in cleaning my teeth. (Actually, she was very nice and didn't hurt me at all. Just writer's hyperbole). She asked me about my forthcoming novel. My answer came without hesitation. "A young doctor goes back to her home town after her world crumbles, but instead of peace she finds conflict when the doctors in town resent her, one of her prescriptions sets up a malpractice suit that could wreck her practice, and someone in town wants her gone...as in dead." Why did I have that ready? Because when I first began working on the novel that was to become Code Blue, I developed an elevator pitch for it. Each time the date for a major writing conference approaches, the social networking sites are abuzz with the same question: "Do you have your elevator pitch?" The elevator pitch is a distillation of your message into a sentence or two. Here's how it gets its name. TFE: What are you writing? Ding.The elevator doors open and TFE exits. Terrorists take over an office building, but unknown to them a detective is in the building and his wife is one of the hostages. TFE: Sounds interesting. (Hands AW a card) Send me a proposal. Of course, AW is describing Die Hard, and in one sentence he's hooked the editor. This is also what's called "high concept." That amounts to describing a story in a few words that allow the listener to sketch out the general structure of the plot in his mind and captures his imagination. You may not be a writer, but elevator pitches work for everyone. Salesmen have an elevator pitch prepared in case they only have a few seconds of face time with their prospective buyer. Ever wonder why entertainers do so well in interviews? They generaly know what they'll be asked, and the sound bites they give out are often the equivalent of a prepared elevator pitch. What about you. 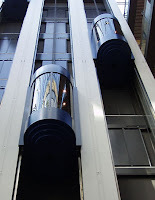 Do you need to have an elevator pitch prepared? Now is the time to work on it--before the elevator door opens. The "random number generator" tells me that comment number two to the previous post is the winner of Michael Palmer's The Last Surgeon. Candace, if you'll use the link at the top right of this page to email me your snail mail address, I'll see that Michael sends you the book. Congratulations. And thanks to everyone who left a comment. Now to the subject at hand: nail-biting time. I thought those days were over. I figured that I was through with this kind of nervous waiting when I learned that I'd passed my medical boards. Before that, I'd gone through the cold sweats and pounding pulse that accompanied waiting for test grades in high school, in college, in medical school. But I'm back on adrenaline overload. The reason? Advance copies of my novel, Code Blue, have gone out to reviewers and potential endorsers. Now I'm sweating every comment (and sometimes just the lack of a comment). It's hard to write a book. I can speak from experience because I wrote three or four (depending on how you count the total revision of my third novel) that were deemed to "show promise" without being good enough for publication. But finally, on the fourth (or fifth) try I produced a novel that will see the light of day in published form. It's hard to write a book, but I firmly believe that it's even harder to put your work out in front of the public and wait for it to be judged. Now, I've been around the block enough to know that I'll never be universally loved and respected. Some will like it, some will probably hate it, and some will be so lukewarm that they won't even have an opinion. Fair enough. But I can't help wishing that the "likers" will significantly outnumber the "haters." Now, like a politician after the polls close, I'll watch for the results. I feel like I'm back in school again, waiting for grades to be posted. Stay tuned. I'll share the results as they're available. This interview first appeared at the great website for writers, Writer Unboxed. It’s reprinted here with permission of WU and my cyber-friend, Dr. Michael Palmer. My debut novel of medical suspense, Code Blue, will be published next April. Because of my medical background and the genre in which I write, I am often asked about medical details in fiction. 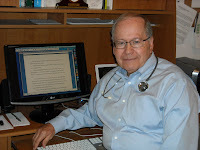 Dr. Michael Palmer is a New York Times best-selling author of fourteen very successful novels of medical suspense. His fifteenth, The Last Surgeon, will be published in February. 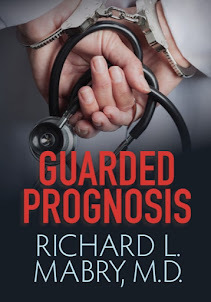 Michael has graciously agreed to join me in answering some questions about medical fiction in general, and giving some tips to authors wishing to add medical details to their own fiction. Michael, we both write medical fiction because that’s what we know. What do you think is the appeal of medical fiction? MP: Readers love not only to be entertained, but to be informed, whether it’s about life on the high seas, in the courtroom, or in the hospital. They want to listen in to the back-room conversations, feel the tension, and experience the thrills. There is also the “natural” excitement of the life of a physician. 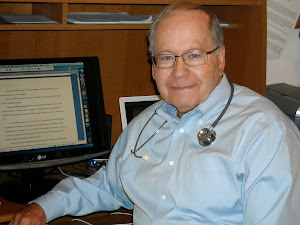 RM: I agree that readers like the thrill of vicariously experiencing the life of a physician. Flying has been described as hours of boredom interspersed with moments of stark terror. There’s not much terror in medicine, but there is tension, and if the boring parts are left out, the good parts can hold the reader’s attention quite well. Not everyone can write a medical thriller, but some novels can definitely benefit from the inclusion of a medical problem or scenario. Do you think a non-medical writer can do this successfully? MP: I do, but I would insist that at some point, non-physicians involve a doc as a consultant. I was able to write about the President’s doctor in The First Patient because my research led to a friendship with Dr. Connie Mariano, for 10 years the White House physician. I also recommend the book Writing Genre Fiction by M. Thomas Milhorn, M.D. RM: Agreed. I would make two suggestions for a writer wanting to include medical details in a novel. First, since you’re writing from a patient/family point of view, don’t get too deeply involved in technical details. And second, do your homework so you know that information provided by the medical professional in the scenario is accurate. What medical problems would you suggest a writer consider for adding depth to their novel? MP: Don’t be afraid to write about any medical problem or issue. Just do your research thoroughly, be fearless, and check your facts with a doc. The Internet is amazing. In The Fifth Vial, I wrote a compelling scene that took place in Amritsar, India, complete with street names and descriptions of the city without ever having been to India. The Internet is wonderful! RM: Again, I agree. Even though I’m a physician, I check the latest details of diagnosis and treatment on the Internet. And because of the wealth of information available, there’s no reason to shy away from any medical scenario. Let your imagination run wild. Read the papers. Follow health news on the Internet. Pick something that you think will spice up your writing and run with it. When you’re writing pure medical fiction, more medical detail is necessary than when you’re just adding a dash of medicine to a novel. In your own writing, how do you find the fine line between just enough detail and getting the reader bogged down? Any tips for the non-medical novel? MP: Character, character, character! Writing is all about people. Don’t get bogged down in medical details. Worry about story and conflict and spice your narrative up with well researched and checked medical information. Write illness from the viewpoint of the patient when possible. RM: Yes, the medical details are just the seasoning in the recipe. How they affect the characters is the important thing. After research to be certain the information is accurate, present it through the eyes and ears of your characters as they learn it from a physician. And don’t forget that our characters—just as most of us do in real life—often hear or perceive information incorrectly. How do you handle questions from writers about medical details they want to incorporate in their novels? Do you direct them to any specific resources? MP: I frankly don’t have time to be anyone’s ongoing consultant. If the question is easily answered in my specialty, I will try and give it a go. Mostly I recommend Wikipedia (believe it or not). RM: I’ll answer simple questions in my area of expertise, which happens to be ENT and allergy. Other than that, I try to give the questioner the search terms they need and direct them to—you guessed it—the Internet. Many of the questions that come to me can be answered through the use of Google or another search engine. But I warn writers that, just because it’s on the Internet, it’s not necessarily accurate. I suggest they stick with sites from medical centers, the NIH, or other reputable sources. You’ve addressed several medical problems in your books. Which is your favorite? (I think I know the answer to this one). MP: Each of my books deals with a medical ethical issue. However, the issues are not as important as the characters—what they have at stake in the book. As you have guessed, I love having written The Second Opinion, but more because of the character of Thea than the information about Asperger Syndrome. 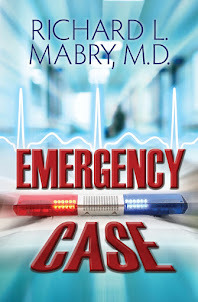 RM: And in my novels, there’s usually some medical situation that has proven to be a Prescription For Trouble (shameless plug for the series) for the physician protagonist. My favorite problem is one I wrote about in a book that hasn’t yet been published, a combination of medications taken by a patient without the doctor’s knowledge, with terrible consequences. What can you tell us about your forthcoming book, The Last Surgeon? MP: Nine people are in the OR for a botched case where the patient, a renowned Arab terrorist, dies on the table before the procedure. Three years later, those in the room begin dying one by one of “natural causes,” accident, or suicide. The medical theme is post-traumatic stress disorder in a trauma surgeon. I love the way it’s come out. The publication date will be February 19, 2010. RM: In my debut novel of medical suspense, Code Blue, Dr. Cathy Sewell comes back to her small hometown looking for healing after her world falls apart. She faces opposition from the “old boy network” among the town physicians, and one of her prescriptions triggers a malpractice suit that may end her career. But her biggest worry is that someone in town doesn’t just want her to leave…they want Cathy dead. Code Blue comes out in April, 2010, to be followed in the fall by book two in the Prescription For Trouble series, Medical Error. To learn more about Michael Palmer, visit his website. And, of course, if you'd like to know more about my own writing journey, check out my website. My thanks to Michael for taking the time to provide expert answers, and to my friends at Writer Unboxed for letting me participate in the original interview. Late-breaking news: Leave a comment on this blog between now and 9:00 PM Central time on Sunday for a chance to receive a copy of The Last Surgeon. Check this blog Monday morning for the name of the winner. (If you've already commented, you're already entered). There was a time when writers wrote and left the details of getting their books out to the public in the hands of their publisher. Occasionally, they hired a publicist. But, by and large, writers weren't expected to get involved in such mundane things as marketing and publicity. That's all changed. Today I've asked Maegan Roper, the Director of Marketing and Publicity for my publisher, Abingdon Press, to give us a bit of insight into this new era. RM: Maegan, thanks for joining us here. When a book is published, what can a first-time author expect from his/her publisher in the way of marketing? MR: Generally, one can expect the publisher to cover the costs of any consumer advertising such as retailer catalogs, ads in Christian consumer publications, Internet campaigns, and some travel for booksignings, author appearances, etc. You can also expect the basic publicity push: press releases to major mass and local media, review copy mailings to endorsers and influencers, and possible pitches to radio and television media. RM: How long will a marketing “push” be carried on by the publisher? MR: That usually depends on how long the budget can be extended Most of the time it’s anywhere from 6 months to a year. RM: Some authors, especially those without much experience, may expect the publisher to do all the work of marketing. After all, they’re writers, not publicists. Would you address that? MR: Yes. While that expectation is understandable, we are fully engaged in a digital shift when it comes to publishing. Authors are now encouraged to be marketers, publicists, and self promoters as well as writers. With the current explosion of social media marketing, most publishers (specifically the larger houses) actually seek out authors who have a fully engaged fan base/tribe already established. RM: What about hiring an outside publicist? MR: This is definitely an option when you’re looking at a major book line launch or title release; specifically, if the publisher only has one or two publicists on staff. Some authors will even hire an outside publicist on their own if they desire more that what the typical publishing house’s publicity staff can handle. RM: In reality, marketing efforts by an author should begin long before a book is published. What things would you suggest? RM: When a book proposal comes to an editor, how much weight is given to "platform" and the “marketing” section? MR: It’s important to weigh the marketing factor when looking at a book proposal. Do they have possible strong endorsers already lined up? Do they have a personal website, blog, and strong existing online presence? While these aren’t the determining factors, it definitely helps an acquisition team when making a final decision. RM: Any other thoughts you’d like to pass on to my readers? MR: At the end of the day, I think we have the distinct opportunity and obligation to the Lord to publish high-quality fiction that is both enjoyable and engaging to read, but also paints a relevant and realistic portrait of our Christian walk. We strive for authenticity, relevance, and excellence in all of the novels we publish: fiction to touch the hearts and minds of readers. Thanks, Maegan, for joining us here. Now I guess it's time for me to get back to writing. Or should I be marketing? Or looking for publicity?